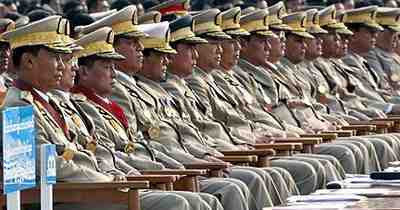 Here are those Burmese cowards in gold braid who are terrified of one frail woman: Aung San Suu Kyi (CLICK). The civilized world is outraged that she has been sentenced to a further 18 months of house arrest in order to keep her silent for the generals' show election next year. And why bother with a show election when the military junta holds all the guns? It won't legitimize the cowards in power. The two scraps of good news are (1) the court's sentence of years of hard labour against Aung San Suu Kyi was swiftly commuted to house arrest and (2) the Yankee Mormon fruitcake who swam to Aung San Suu Kyi's lakeside home and gave the generals the excuse they needed has been jailed for seven years, including four years of hard labour. He deserves it. All religious pests who knock on your door to tell you how much their imaginary god loves you should get the same sentence. Update: Avaaz.org has organised a petition on behalf of Aung San Suu Kyi; CLICK to sign it.